Infinite Art Tournament: Saint of the Month: Saint Stephen of Hungary! Saint of the Month: Saint Stephen of Hungary! Timeframe: c. 975 - 1038. Credentials: Canonized by Gregory VII in 1083. Symbolism: “In art,” says one source, “Saint Stephen is dressed in royal regalia with a sword and banner of the cross. He may also be shown (1) offering the regalia to the Virgin; (2) on horseback; (3) with his son, Saint Emeric; (4) holding a church in his hand; or (5) holding a standard with the figure of the Blessed Virgin on it.” Since all of these except the unhelpful point (3) are very common saintly postures, however, they are unlikely to be of much help in identification. Everybody who knows the first thing about Hungarian history, which is to say Hungarians, knows that the Magyar peoples coalesced into a more or less unified polity in the late ninth and early tenth centuries. 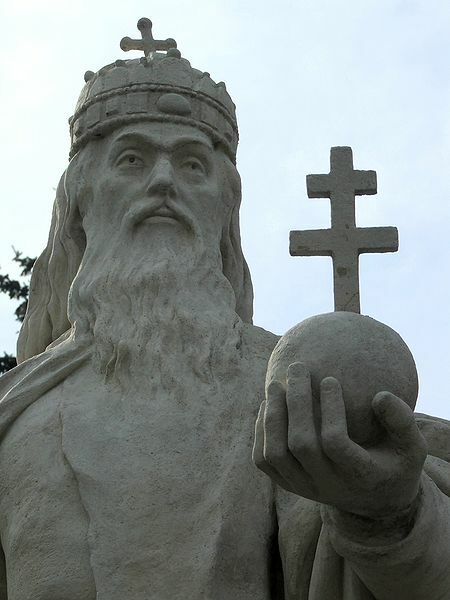 Originally from the eastern part of the modern Russian heartland, they became the dominant power in the Carpathian Basin under Árpád, a leader sometimes referred to as a “Duke” in the English-language literature. A few Dukes later came Géza, a Christian convert who actively sought ties with Rome and Western Europe. 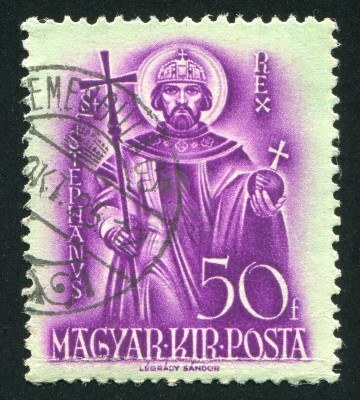 When Géza died, control of Hungary was contested between his non-Christian brother Koppány and his Christian son Stephen. Stephen won, consolidated royal power and the emerging Hungarian state, and introduced a feudal system of government, frowned on today but reasonably progressive 1000 years ago. When he was fifteen years old, his father gave him the commandment of his armies, seeing his virtue and Christian ardor. Already Stephen was beginning to root out idolatry and transform the pagan customs still existing among the people. At twenty years of age, he succeeded his good father, who died in 997. He suppressed a rebellion of his pagan subjects, and founded monasteries and churches all over the land. He sent to Pope Sylvester, begging him to appoint bishops to the eleven sees he had endowed, and to bestow on him, for the greater success of his work, the title of king. The Pope granted his requests, and sent him a cross to be borne before him, saying that he regarded him as the true apostle of his people. Now, I’m happy to report that most of the major saint sites are a little more nuanced in their take on all this. There is clearly some discomfort that such a high-profile saint – for all his importance, apparent sincerity of belief, and personal piety – isn't a little more compatible with our contemporary notions of basic human rights. After all, “rooting out idolatry” and “suppressing a rebellion of pagan subjects” are two ways of saying “killing people who don’t agree with you.” And probably the reason they don’t agree with you is because you are “transforming the pagan customs still existing among the people,” which is to say subjecting them to the humiliation of having to say and do things they find objectionable out of fear for their lives and property. Inviting in foreign missionaries to speed up the conversion may not have played too well in the villages either. When Saint Stephen was about to die, he summoned the bishops and nobles, and told them to choose his successor. He urged them to nurture and cherish the Catholic Church, which was still a tender plant in Hungary, to follow justice, humility, and charity, to be obedient to the laws, and to show at all times a reverent submission to the Holy See. From the perspective of Rome, then, Stephen was a profoundly Good secular ruler – not only did he advocate Church control of the appointment of bishops, but even brought the bishops in on selection of a new king! But you don’t have to be especially cynical to note a bit of quid pro quo going on behind his “reverent submission to the Holy See.” It was the Holy See, after all, that credentialed his elevation to kingship, thus hugely enhancing his personal and political credibility within Europe and essentially granting Hungary independence from the Holy Roman Empire. For this kind of endorsement, letting someone else pick your bishops would have been a small price to pay. * This apparently has to do with a reorganization of the Calendar of the Saints after Vatican II. I'm going to need to learn more about that if I'm going to grow as an amateur hagiographer. That guy is one helluva shot-putter! Yeah, and on the stamp he looks like he could probably handle a javelin too. I wonder if that's "the regalia," as in "offering the regalia to the Virgin"???" The Infinite Art Tournament: Clemente v. Clouet! Element of the Month: Bohrium!